Long, sleek and striking, this necklace is the signature piece of the Renaissance collection. Long, sleek and striking, this necklace is the signature piece of Christelle’s Renaissance collection. 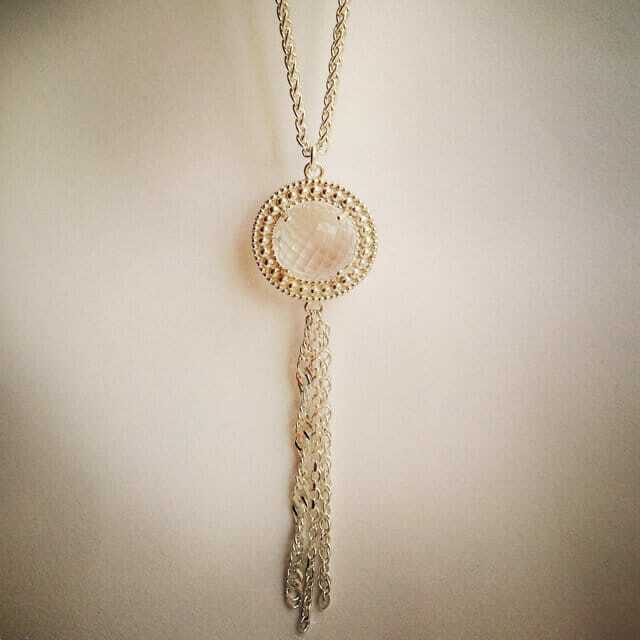 Its core is a beautiful faceted sphere of crystal quartz set in a silver or gold orbit intricately decorated with tiny spheres and finished with a sensual dangling tassel. She combines precious metals with high quality crystal quartz, blue topaz, rose quartz and green and purple amethysts, all ethically produced and cut to her specifications by a trusted family-run business in Brazil. An irresistible piece which works magic on its own, or looks super stylish paired with the bracelet or earrings in her Renaissance collection, all designed and handcrafted in Edinburgh. Crystal quartz, blue topaz, rose quartz, green amethyst, purple amethyst.